Void Acoustics will be featuring several new products at PLASA 2009 in London, stand No. 1-C12. Voids new loudspeaker products include the Stasys Prime wide-band arrayable point-source system, the Stasys 5 Mk2 low-frequency system with pressure plate to enhance transient response, plus the Arcline 12 medium-format line-array enclosure. On the stand will be two new models in Voids UK-built Infinite X amplifier range - the Infinite X7 and Infinite X8 power amplifiers. Completing the companys line up at PLASA09 will be industry veteran Ken DeLoria, who recently joined Void as head of its US division. A wide-band loudspeaker design for large-scale touring, arena and stadium sound, Voids new Stasys Prime uses two 15" LF drivers and a 1.5" neodymium HF driver to deliver a continuous output of up to 142dB, and an extended low-end down to 90Hz negating the need for separate upper-bass enclosures. Achieving lossless summation between adjacent enclosures, the design offers a seamless transition within an array, greatly improving intelligibility and phase coherence, as well as efficiency, as adjacent outputs are free from destructive interference. 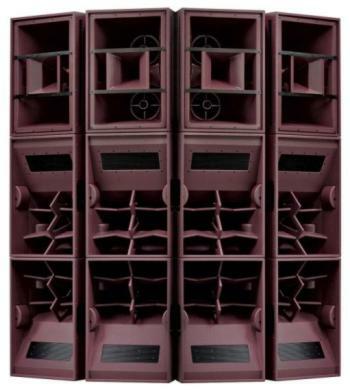 Stasys Primes super-high efficiency and 2-way active operation makes it an environmentally-conscious system, needing fewer amplifiers, with lower output power, to deliver a given result, while easing handling and transport. The Stasys 5 Mk2 low-frequency 1x18" enclosure is designed for demanding live performance applications. This design harnesses some of the energy that would normally be dissipated in its rear chamber, by firing the transducer onto a passive aluminium pressure plate - the plate's restoring force is reflected back onto the transducer to provide a substantial increase in transient response and efficiency, and a continuous output of 135dB. As with all premium Void enclosures, the use of resonance mapping has resulted in an extremely ridged structure, with very low colouration. The Stasys 5 Mk2 also uses 'coolwave' technology to reduce thermal compression and ensure consistently high output levels - used in combination with Voids recently-developed 5 double-coil neodymium drive unit to give the enclosure an output-to-weight ratio near the theoretical maximum, and making it one of the lightest enclosures of its type available. Void's new medium-format Arcline 12 line array enclosure solves the challenge of generating a coherent cylindrical wavefront - from a typical hang that exhibits the same decay-per-distance in lower octaves as the mid and HF frequencies. To achieve this, the Arcline 12 incorporates a high-efficiency horn-loaded low-mid section, which delivers the necessary low-frequency projection down to 90Hz. Using the same principle as the Arcline 6, the new Arcline 12 has its physical components positioned on an arc to form a common virtual feed-point, with this approach, in conjunction with the designs 120-degree horizontal dispersion, enabling the systems wide and uniform coverage pattern, free from phase and response anomalies. Void Acoustics Infinite X power0 amplifiers are manufactured in the UK using the companys dedicated production facility. The Infinite X range includes two- and four-channel amplifiers, featuring high-efficiency, high-current switch-mode power supplies. New for PLASA are the Infinite X7 and X8 two-channel designs, delivering 2 x 2000W and 2 x 2600W into 4 Ohms respectively. All models deliver increased power output into a 2 Ohm load. © 1997 © 2009 Pro-Music-News™. All rights reserved. Thank you for visiting Pro-Music-News™.